Yet another curious wooden figure I came across in one of those markets outside Barcelona (there are many out there which are only set during local celebrations). 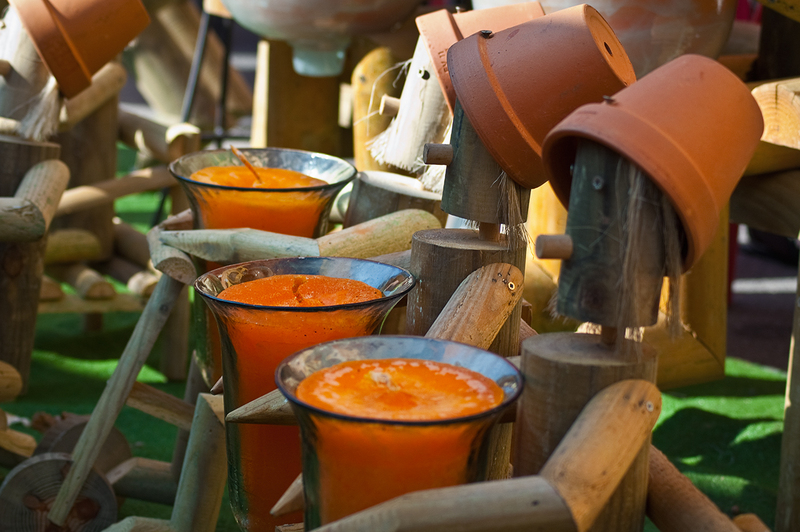 Here are three candle holder wooden toys in a row with selective focus on the one in the middle. Hope you like the result. They're great, wish I had one. They remind me of Bill & Ben The Flowerpot Men, a children's TV series when I was little! Is it the feast of La Merce this week? Very cute wooden "dolls" holding candles! love the colours... somehow felt very autumn as well. -Yes Winifred, next Friday it is. Long weekend! Hooray! -Dolls? Well, come to think of it, yes, they could be. -I guess that orange color may be responsible for that. wonderful for a garden during evening filled with friends and cool wine. please have a wonderful wednesday. Looks like something I made as a kid.